An Israeli air strike on a car in Gaza City during a security operation has injured a Reuters news agency cameraman and a local journalist. At least one rocket hit the car as the cameraman was filming, knocking him unconscious, while the second man received serious leg wounds. The Reuters car was clearly marked all over as a media vehicle. The Israeli army said the car had not been identified as press and expressed regret that journalists had been hurt. The agency named its cameraman as Fadel Shana and the other man wounded as local website journalist Sabbah Hmaida. Two Palestinian bystanders were also injured in the attack. A Hamas militant was killed in a separate Israeli air strike on Gaza later on Saturday. Israeli ground forces backed by helicopters were conducting an operation inside the Gaza Strip on Saturday evening, near the Karni crossing. "During the operation, there was an aerial attack on a suspicious vehicle that drove in a suspicious manner right by the forces and in between the Palestinian militant posts," Israeli army spokeswoman Capt Noa Meir said. "This car was not identified by the army as a press vehicle. If journalists were hurt, we regret it." The Reuters armoured car was clearly labelled as a media vehicle, with signs on all sides, including the roof. 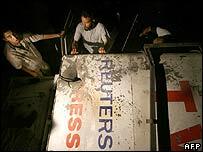 According to the Associated Press, the white sports utility vehicle was emblazoned with the Reuters logo and had "TV" and "Press" written on it in English, Arabic and Hebrew. The front seats of the car were covered in blood, much of the inside of the vehicle was torn by shrapnel and one of the bullet-proof windows was completely destroyed, the agency says. Mohammed Dawdi, head of the local journalists' union, described the attack as a "cold-blooded crime". The Israelis have been conducting operations against militants in the Gaza Strip for two months. 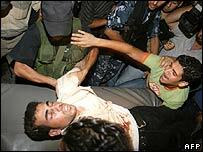 The campaign was sparked by the capture of an Israeli soldier on 25 June.